When I was in grade school, I had a teacher who told us eggplants are useless because they don’t have nutrients to nourish the body unless it’s cooked with eggs. Being young and naïve, I believed her words and stopped eating eggplants which disappointed my mother. Back then there was no internet and teachers were considered authorities on the subjects they taught, so I grew up with the false belief that these purple vegetables are worthless. It was only when I was in college that I found out my teacher was wrong and started thinking what else she taught in class which aren’t based on facts. Anyway, according to my discovery, eggplants are rich in vitamins and minerals, not counting that they’re excellent source of fiber, too. I felt bad I wasted many years not eating this awesome vegetable. But now I know better and I make sure eggplants are part of my family’s diet. 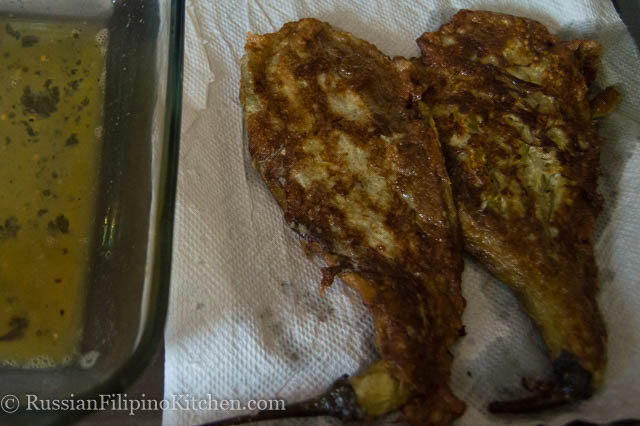 The recipe I’m going to share in this post is a well-loved Filipino recipe. 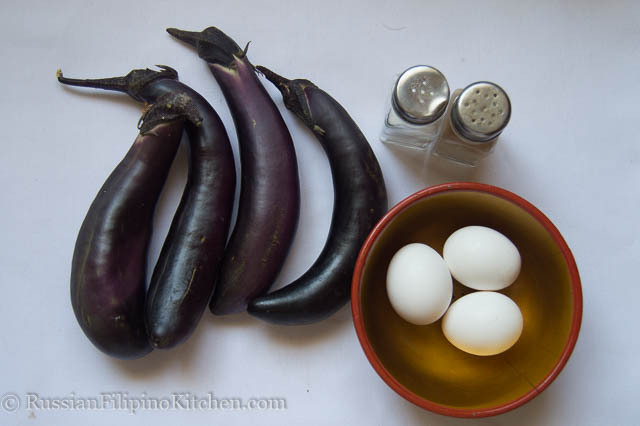 “Talong” is the Tagalog and Visayan word for eggplant. “Torta” means omelet in Tagalog but means different in Visayan. 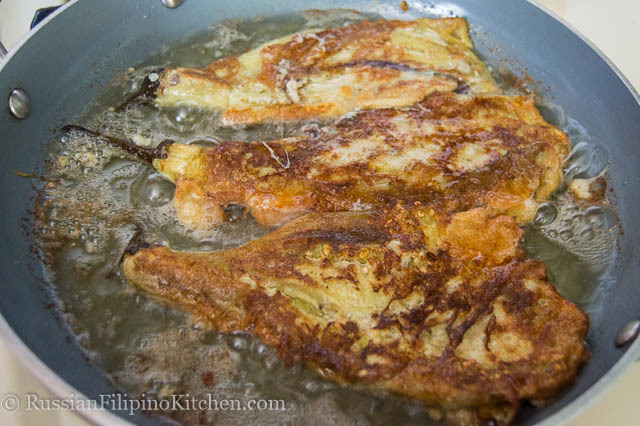 But let’s just stick with the Tagalog term for the eggplant omelet which is “tortang talong”. 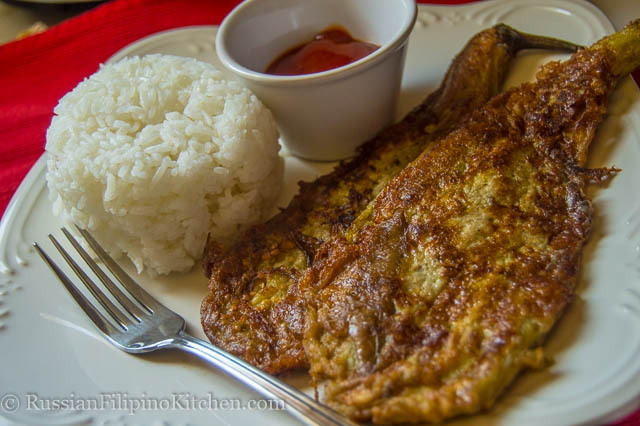 This is a popular dish in the Philippines because it is inexpensive, versatile, and simply tastes good. It’s perfect as a side dish. 1. Pierce eggplants with the tip of a knife or fork then arrange on a foil-lined baking sheet. 2. 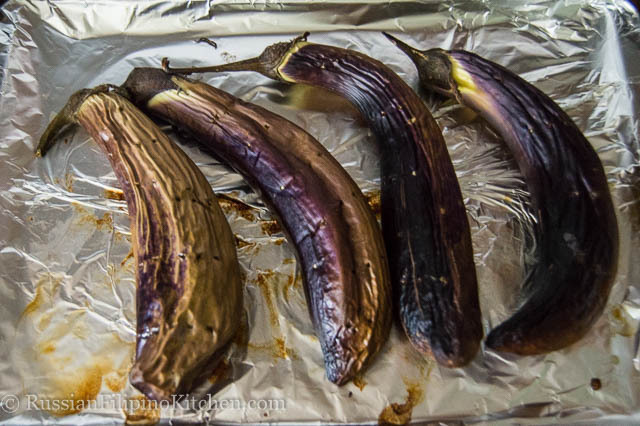 Roast eggplants three ways: over hot charcoals, on top of the stove burner, or in the oven. I personally prefer the last option due to convenience and less cleanup afterwards. 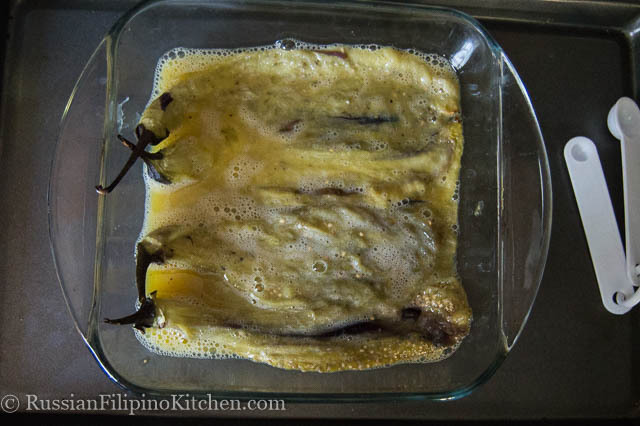 To roast eggplants in the oven, set oven to broil setting and roast them uncovered for 20-25 minutes until skin has wrinkled and darkened. 3. Once eggplants are cool to touch, carefully peel them, removing most of the skin. If you are unable to remove all of it, don’t worry, it is perfectly okay. Leave the stems intact. 4. In a bowl or plate, season eggs with salt and pepper and lightly beat. 5. Flatten eggplants with a fork and submerge into the beaten eggs mixture. Coat all sides. 6. Heat oil in skillet and fry eggplants about 2 minutes per side until golden brown. 7. Drain excess oil on a plate lined with paper towels. 8. Serve with ketchup or rice. Pierce eggplants with the tip of a knife or fork then arrange on a foil-lined baking sheet. 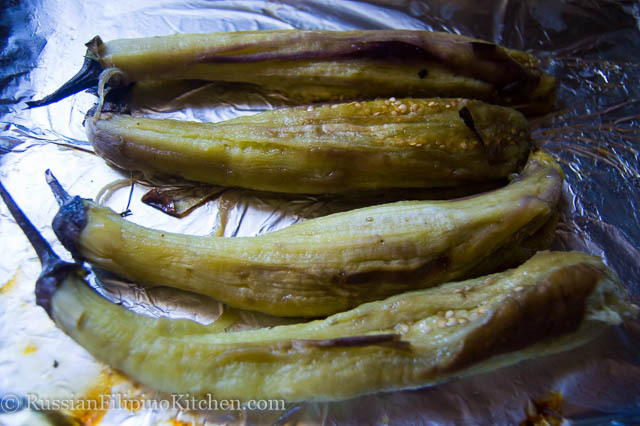 Roast eggplants three ways: over hot charcoals, on top of the stove burner, or in the oven. I personally prefer the last option due to convenience and less cleanup afterwards. 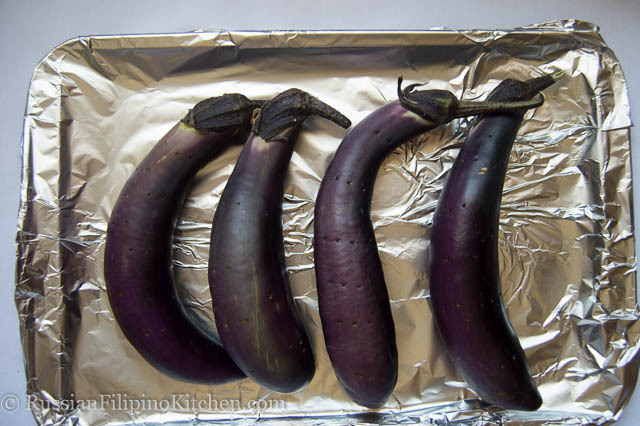 To roast eggplants in the oven, set oven to broil setting and roast eggplants uncovered for 20-25 minutes until skin has wrinkled and darkened. Remove from oven and set aside to cool. Once eggplants are cool to touch, carefully peel them, removing most of the skin. If you are unable to remove all of it, don’t worry, it is perfectly okay. Leave the stems intact. 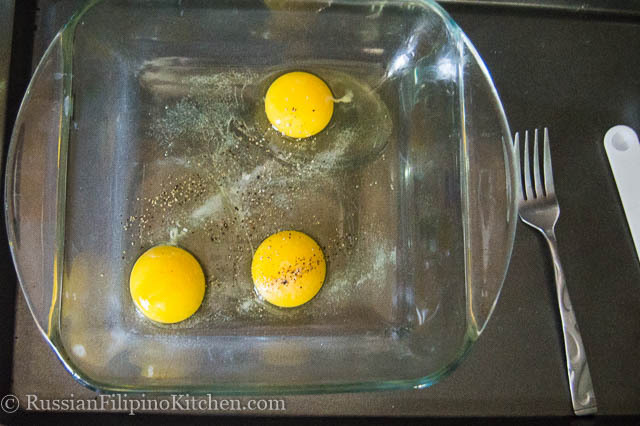 In a bowl or plate, season eggs with salt and pepper and lightly beat. Flatten eggplants with a fork and submerge into the beaten eggs mixture. Coat all sides. Heat oil in skillet and fry eggplants about 2 minutes per side until golden brown. Drain on a plate lined with paper towels to remove excess oil. Serve with ketchup or rice.